Stratasys has introduced BioMimics, which is claimed to provide highly realistic, functionally accurate 3D-printed replicas of complex anatomical structures. Provided through Stratasys Direct Manufacturing, the new service is initially available in North America to offer 3D print medical models for hospitals, researchers and medical device manufacturers. BioMimics helps to eliminate the restrictions associated with training, research and testing on animal, mannequin or cadaver models, and provides models of both soft tissue and hard bones through multi-material 3D printing. Through combining Stratasys’ PolyJet 3D printing technology with new materials and software, organizations can create specific 3D printed models what professionals require during live medical scenarios. BioMimics will be initially used to model the complexities of heart and bone structures, while vascular anatomies expected in early 2018. Stratasys healthcare solutions general manager Scott Rader said: “Testing innovative medical devices, teaching principles of surgery, providing continuing medical education, and demonstrating new products to clinicians all require ‘bench-top’ models that simulate human bodies and diseases. Stratasys Direct Manufacturing offers 3D printing and advanced manufacturing services and helps companies at all stages of product development. With around 500 employees, the company operates seven manufacturing facilities in the US. 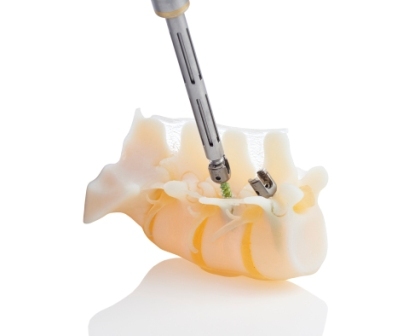 Image: A pedicle screw driven into 3D printed model of a patient’s spine. Photo: courtesy of Business Wire.